In 2016 the BMS’s Fungus Records Database of the British Isles (FRDBI) was transferred to new software based on the Biological Records Centre’s Indicia/iRecord packages. One of the aims of this was to enable mycologists to enter their own data, either by data entry into web-pages or by bulk upload of “spreadsheet” data. The present document explains how to use the online webpages to enter fungus records. Before entering records you need to create a user account (click on Create new account) and fill in the details. Please enter your real name in the spaces for Username, First name and Last name . The username is only visible when you place a comment on the system. The email address must be a valid email address to receive the activation email. This email address will also receive occasional news emails as well as any notification emails arising from records that you enter which are remarkable in some way – eg rarely recorded or new to Britain! When you’ve filled in your details, accept the Terms & Conditions and click Create new account. You will recieve an email with a link to activate the account. Follow the link and then click on the login button. Next enter a password, repeat it and then submit / save. You will then be brought back to your account page where you do not need to enter a password again. You can then scroll down and enter a location in the 'Where do you usually record' section. This will enable the map system to start in your usual area when entering a record. Submit again. Please read the notes about entering, viewing and downloading records before you begin in order to make sure you are using the correct entry form / webpage. You may find these videos based on iRecord useful. The first shows how to enter a basic record. Generally you will be adding a number of records, eg for the same date, site and people. The padlocks allow you to “lock” a field so its value is held for subsequent records. If you’re used to using the mouse-wheel to scroll up and own, beware that the map uses it to zoom in and out. If the cursor happens to move over the map as you scroll, you’ll suddenly find you’re zooming instead of scrolling! Once you’re used to it, it isn’t a problem, but it can be confusing the first time it happens. This is a text field with the format: 24/03/2016. For convenience a calendar is presented when you click on it, but you don’t have to use it (eg if you’re entering historical data). Or you can use the calendar and then edit the resulting date. Type in the first part of the fungus name. or (better) use the standard 2-letter genus/3-letter species abbreviation (eg amrub for Amanita rubescens). Pause after typing and a drop-down list of names appears. This list includes both current names and synonyms and also English names. Currently this list is being simplified and updated. When there are too many names to display the list ends with More available which will reveal more names. When you’ve selected a name the current name for that taxon is displayed in the “Current name” field. Check that this is the fungus you are expecting. This is a similar taxon-picker to the fungus name, but allows you to select any organism, not just a fungus. One of the design aims of the new FRDBI was that the host records (be they plant, fungus or animal) would be stored in the database as full records and available to researchers studying that group. So please try to record accurately, and where appropriate use species names rather than just genera. For dead wood, especially where it has been brought onto site (eg fence posts) use Substrate rather than Associated Organism. 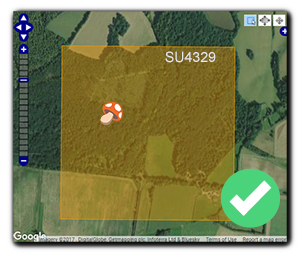 It is often easier to click on the map to find the grid reference although it is still possible to enter the reference directly. For GB OS grid entries the format is AAnnnnnn with no spaces and even number of numbers. Please check that the fungus was INSIDE the orange highlighted square on the map as shown here. 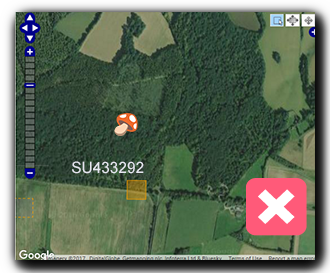 It is true to say the fungus could be found within SU4329 whereas it is clear that the fungus was NOT to be found within SU433292 which is where the recorder's car is parked. A grid reference is an area not a single point and future uses of the data requires the data to be entered appropriately in the first place. You can select a larger grid square by zooming out or holding down the '-' key whilst clicking on the map. There are three boxes at top right: the selection tool (the default) which allows you to pick the location of interest, full screen mode (press esc to get out of full screen mode), and the dragging tool to drag the map within the map box. Zoom in and out using the zoom bar at the left or the mouse-wheel. The plus-symbol near top right allows you to switch between displaying Google Streets and Google Satellite. Normally you will use OS grid references. If you want to use Irish Grid or Lat/Long you can change it in the box below Map reference. Enter a locality name (ideally from the OS map). If you are going to want to reuse the locality, eg if it’s a regular foray site, click on Remember site. Next time you can just type the first few letters and it will be offered. The second menu item on the Data entry menu is My sites which allows you to review the sites you have entered. For people who have registered on the system can be selected from a drop down list by starting to enter their lastname. Try to persuade non registered people to register as this will stop any confusion about identity. Where this is not possible use the same format in free text ie “Surname, First name” eg “Storey, Malcolm” or “Ainsworth, Martyn”. The top picking list includes most of the regularly-used books and papers. It wasn’t felt necessary to distinguish which volume of various multi-volume series was used as it’s generally obvious from the taxon being identified, however, please make sure you choose the right edition. If the literature in question isn’t there, type it into Other literature. You are encouraged to upload photographs of your fungus. You can currently load up to 4. Ideally these should be chosen to back up the identification. If the image content isn’t self-evident (eg photomicrographs of cheilo- or pleuro-cystidia) please enter an explanation in the Caption. Uploaded images will be downsized to 1600 pixels if you haven’t already downsized them yourself. You retain copyright in your photographs, but by uploading the photograph you grant the BMS and its successors an irrevocable right to display your images in connection with the fungus record. Click on Submit when you have finished entering data for that record. Don’t navigate to a different page before clicking submit. Again, click on Submit when you have finished entering data for that record. Don’t navigate to a different page before clicking submit.